A drug coupon is a coupon intended to help consumers save money on pharmaceutical drugs. They are offered by drug companies or distributed to consumers via doctors and pharmacists, and most can be obtained online. There are drug coupons for drugs from many categories such as cholesterol, acne, migraine, allergies, etc. 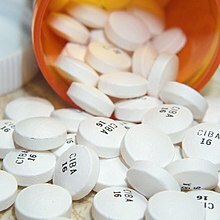 Direct-to-consumer or "DTC" marketing of prescription drugs is common in the United States. Patients frequently inquire about or request medications they have seen advertised in print or on television. Pharmaceutical companies use drug coupons as a marketing tool to stimulate demand for their products. Drug coupons are commonly offered for new products to stimulate demand or ameliorate high co-pays for non-formulary (non-preferred products) as a way to level the playing field and remove the disincentive for using a drug that is not covered by insurance. In an effort to avoid unregulated resale of drugs, the Prescription Drug Marketing Act of 1988 banned the traffic or counterfeiting of redeemable drug coupons. For instance, it is against the law to buy or sell coupons for prescription drugs on E-Bay. Most drug coupons are printed by consumers using their personal computer and printer. Drug coupons reduce out-of-pocket costs for consumers in a variety of ways such as instant savings offers, free trial offers (also known as try-before-you-buy offers), copay reduction or rebates. Generic drug companies rarely offer coupons, though insurance companies occasionally offer discounts on generic drugs. In addition PBMs (Pharmacy Benefit Managers) offer discount cards that act similarly to coupons. These cards work for both generic and brand medications and can save cash paying customers up to 75% on their prescription medication. Medicare was designed by the U.S. government in 1965 to help senior citizens and the disadvantaged afford health care. The Medicare Prescription Drug, Improvement, and Modernization Act of 2003 (MMA) put Medicare Part D into effect on January 1, 2006, expanding Medicare benefits to include subsidized prescription products for Medicare beneficiaries in the United States. Coupons are prevalent in product categories where there is a lot of competition, such as dermatology products, lipid modifying agents and the medical treatment of ophthalmological conditions such as glaucoma. So-called "lifestyle medications" (e.g., treatments for baldness and erectile dysfunction and cosmetic-oriented products such as wrinkle fillers) typically are not covered by insurance and are unlikely to have coupons. So-called specialty pharmaceuticals (such as TNF inhibitors) also use coupons as a marketing tactic. Coupons for oral or topical agents can provide significant savings, sometimes as much as several hundred dollars per year. Coupons (usually in the form of co-pay assistance programs) for specialty pharmaceutical products, particularly injectable drugs such as TNF inhibitors can be worth several thousand dollars per year. Unlike the distribution of drug samples to patients, without exception drug coupons require a valid prescription written by a licensed physician and dispensed by a registered pharmacist in order for the offer to be fulfilled. Having a physician and pharmacist involved in the transaction enhances patient safety, unlike the use of drug samples. This dual layer of professional scrutiny ensures that the drug product has been properly stored, is not expired, is dosed correctly in an age-appropriate fashion, and that the patient's medication history has been checked to avoid drug interactions. Drug samples, on the other hand, are often dispensed by doctor's office staff without the benefit of a prescription. The storage of drug samples is largely unregulated, leading to the possibility of spoilage or pilferage. Additionally, in case of a recall or other similar event there is a paper trail that simplifies patient notification. Critics of prescription drug coupon programs have argued that these programs lead to higher healthcare costs for consumers. Typically, American patients with health insurance pay a percentage of the cost of a prescription drug out of pocket, with insurance companies responsible for the rest of the medication's cost. Insurance companies charge higher copayments for brand-name drugs than for generics in order to encourage patients to choose less expensive alternative medications when they are available. However, by reducing a patient's copayment, prescription drug coupons also reduce a patient's incentive to choose a less expensive generic medication. As an example, NPR reported in 2009 that the generic acne medication Minocin cost $109 a month while a newer alternative called Solodyn cost $514 a month. Solodyn can be taken only once daily, while Minocin must be taken twice daily. Since Solodyn's manufacturer offers a coupon to reduce copays, patients may believe that both drugs cost the same amount. Drug coupon advocates argue that coupon programs enhance medication adherence by reducing or eliminating drug copays. As of 2008, the U.S. Food and Drug Administration (FDA) was planning a study to see if coupons make patients overlook drug risks and side effects in their effort to save money. Unions have filed several lawsuits seeking to ban drug coupons, characterizing them as illegal kickbacks. As of June, 2013 Three of these lawsuits have been dismissed. Six more are pending. This ruling is seen as vindication for the Pharmaceutical industry that drug coupons are an acceptable business practice. ^ "Milestones in Food and Drug Law History". Food and Drug Administration (FDA). April 30, 2009. Retrieved 2009-06-25. ^ a b c Kritz, Francesca (December 3, 2007). "Check out drug coupons, then check bottom line". Los Angeles Times. Retrieved 2009-06-28. ^ Joffe-Walt, Chana (October 20, 2009). "Drug Coupons Hide True Costs From Consumers". NPR. Retrieved November 19, 2011. ^ "Bristol-Myers Coupons For Abilify Are Not Bribes: Judge" (PDF). Pharmalive. 1 October 2014. Retrieved June 6, 2013. "Drug Coupons". AARP. April 15, 2008. "Companies, groups help with drug costs". Los Angeles Times. June 8, 2009. If Drug Copays Have You Down, Check For A Coupon. NPR. January 7, 2011. "Coupons for Patients, but Higher Bills for Insurers" The New York Times. January 1, 2011. This page was last edited on 2 April 2018, at 17:06 (UTC).